One of our regular holiday pastimes is exploring new bookstores, and this year was no exception. One of my favorite discoveries on a recent trip was Shakespeare’s Storybook, subtitled Folk Tales that Inspired the Bard. In it, storyteller Patrick Ryan explores the traditional tales that may have inspired some of Shakespeare’s most iconic stories. Imagine the children’s stories of Shakespeare’s childhood as fodder for his imagination. Who knew that Taming of the Shrew may have roots in a folk tale titled “The Devil’s Bet,” or that As You Like It may have resulted from a mash up of a 14th century poem that is similar to Robin Hood and an early version of Snow White? 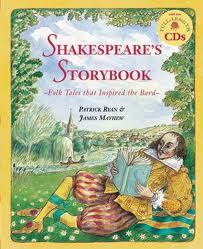 Shakespeare’s Storybook is fascinating. It links tales across centuries in a kind of story genealogy that portrays Shakespeare, not as an isolated genius, but as one profoundly influenced by the culture around him. It also represents Shakespeare’s processes as problem finding of the highest order. For anyone teaching Shakespeare (especially to younger readers), this is a resource not to be missed, regardless of whether Ryan’s speculations about Shakespeare’s story-sources are accurate. (And, of course, we’ll never know.) You can begin by sharing the stories, but Shakespeare’s Storybook also offers opportunities for creative challenges. You might talk about the cultural influences on Shakespeare, and how he used them to find stories. He didn’t use the stories intact, but explored them and built on them. This is a great way to teach characteristics of creative people—not as magical geniuses to whom ideas spring out of the air, but as humans who look at the world around them with fresh eyes. You might send students out to look for examples of current TV or movies that might have its roots in earlier stories. Explore the problem finding techniques Shakespeare may have used. You’ll find examples linked to SCAMPER—substituting, combining, etc.—when shifting from the original takes to his scripts. Try modeling Shakespeare’s problem finding by taking a familiar folk or fairy tale (say, The Three Bears or Cinderella) and envisioning how it could be transformed into a contemporary story. You could, of course, also try transforming it into Elizabethan drama, but since Shakespeare wrote for his contemporaries, why shouldn’t we? You might challenge students simply to devise the basic plot without necessarily writing the whole story, play, TV show, or movie. How about a contemporary Goldie housesitting for a family named Bear? Can you envision a situation comedy in which she ruins the food, breaks the furniture, and is found asleep in their bed? The practice in metaphorical thinking is a fine exercise as-is, and it is likely to result in greater appreciation for the complexity of Shakespeare’s task. If your students come up with new options for story/dramas, I’d love to hear about them.